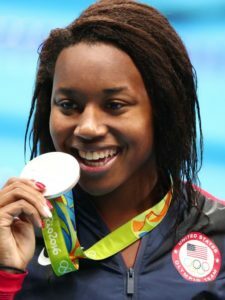 “I was so excited,” 15-year-old Jaila Gladmon of Snellville, GA said after Simone Manual became the first African-American woman to win an individual swimming event at the Olympics last week. She continued, “When I saw her touch the wall, I could feel her emotion.” Jalia understood that her dream of going to the Olympics could be a reality, she told the Atlanta Journal-Constitution. For any of us who have aspired towards a goal, seeing people who resemble us becomes key to moving us forward. When I was a young girl back in the 50’s and 60’s I loved to read about successful professional women. I can still see the book on my shelf about Jane Addams,the 19th-century social activist who started Hull House for poor immigrants in Chicago. Her life of altruism drew me towards my future career choice of counseling. I also savored a daily comic strip in the NY Post with Brenda Starr that featured a fearless and assertive red haired woman investigative reporter. I wanted nothing more than to BE Brenda. Though I didn’t realize it at the time, I now see that I was searching for my own role models. I didn’t see many women working outside the home except for the teachers in my school. Back then, being a mom, homemaker and community volunteer was the norm in the suburban Long Island, NY community where I was raised. T. V. sitcoms like The Donna Reed Show, Father Knows Best and Leave it To Beaver showed a fantasy world. Perfectly coiffed mom’s greeted their kids, homemade cookies in hand. Even then, I knew that I would never be that mom. The point was driven home when I failed Home Economics in 7th grade! It was also difficult to be a working mother in the 1980’s. I was fully in love with both my kids AND my profession. If I hadn’t had older working women mentors to encourage me, I would have had a much harder time keeping the moving parts going. Role models rock. In her classic book Men and Women of the Corporation, author Rosabeth Moss Kanter said that an underrepresented group gains power by becoming a critical mass. Increase the numbers and increase the power balance. I believe that seeing more women in leadership roles shows girls and women of all colors that it is possible to move into unchartered career waters. More organizations are waging a full frontal effort to recruit more talented women and it is having an impact. Check out the article Why Diversity Programs Fail to learn more about how strategic, targeted efforts in diversity make a tremendous difference in strengthening the health of organizations. I do have hope that we will see more women encouraged to pursue their dreams by Olympians and others. Perfecting her breaststroke in a Snellville, GA pool is a teenager named Jaila, inspired to go for the gold medal. And for today, that is good enough for me. This entry was posted in Uncategorized on August 22, 2016 by Jennifer Kahnweiler.